As I think I mentioned before, I've been busy compiling an autumn/winter trend report for Brum Notes magazine. I decided that for the most part, it'd be easier to physically go shopping to find pieces that I wanted to include. So on Wednesday that's just what I did. Easier? yes. Enjoyable? Not really. When you're poor (definition of my poverty is £20 to last a month until student loan arrives) shopping is no fun, people. It's bad enough having others around you rave on about the new season's clothes, but having to go out and painstakingly choose the pieces you like best yourself without being able to buy anything is pure torture. Feeling sorry for myself aside; the key trends I selected to write about (which I deemed suitable for the magazine's readers) were: Knitwear, Fur, Camel, Leopard Print, Lace/Velvet, Country and Military. The main reason for my outing was to check out some independant shops, mainly vintage, where I wouldn't be able to see the stock online. 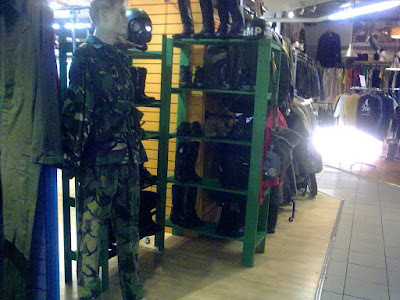 First off, I wandered up to Birmingham's Oasis Market to see what their vintage department had to offer. The first thing that struck me was their display opposite the entrance. Military-inspired no less, complete with gas masks, camoflage- the whole shebang. They also had furs and quilted jackets prominently on display- these guys have clearly been reading their Vogues. Next on my list was COW. I expected COW to pretty much have everything covered, but it was the knitwear selection I wanted to size up in particular. Chunky knits are where it's at this season and the best kinds are adorned with kitsch Nordic and Fairisle patterns- so vintage knitwear should definitely deliver. COW didn't disappoint; their knitwear selection was the best of the vintage shops I saw- if only for the sheer quantity of it. Shoppers are certainly spoiled for choice. Whilst in COW, I also browsed the sale rail and checked out the bargain bag bin in the hope of finding something cheap enough to justify purchasing. I came away with this velvety, er, thing. I think the velvet justified me buying it as I guess it's on trend; although I think I may have had my rose-tinted bargain specs on because I'm not entirely sure I like it or if I'll even be wearing it! Only 3 quid though. Next on the list was Urban Village as I wanted to take a look at their Barbour jackets. The brand has gained increased popularity with the rise of the 'country' trend- as well as extra exposure at this year's festivals. If you're looking for a vintage Barbour jacket in Birmingham, this is the place to go. UV stock a pretty good selection, with the prices I saw ranging between £35-£45. If you fancy splashing your cash on a new one, try A Too Menswear on Ethel St. Obviously they just stock jackets in the menswear dept. but I reckon they look better- a lot more choice too. After UV, I decided to walk through the Custard Factory to the shop's old home by the lake to check out the 'General Stores' (home to extra vintage sellers once sharing the same building as UV). To my surprise the shop had disappeared! Well, the building was still there but the stuff in side wasn't. Before walking off, I spotted a sign for another vintage shop (I've forgotten the name!) and with a quick glance back round I spotted it- just a few doors down. The owner was very lovely and chatty. She greeted me by saying she loved my jumper (she knits and sells very similar ones) and was shocked when I confessed that it only cost £3 (or could've been 2, I forget). I told her that it was from this weird sort of warehouse sale in Digbeth and she knew where I meant right away. The lady from the vintage shop told me that the woman from Credit Crunchers had started selling unwanted clothes but has since cottoned-on to the vintage racket and was now slapping hefty price tags on her stuff. Curious about this, I popped in to see what was going down. They were closing when I got there (nobody I know would describe me as an early bird) but I was let inside nonetheless. I went to the corner where I'd found my jumper and could only see jumble sale-esque clobber. The man who let me in then ushered me over to the area near the till where there were more clothes, clearly thinking he knew what I was after. Low and behold, some slighty better looking half-vintage clothes (I say half because most of the things I saw were 90s cast-offs at best). Yet here they were, shielded behind the till and roped off as if they were precious antiques in a museum- nothing carried any prices on either. The lady at the vintage shop told me that she'd asked the price of a stained jacket and was told £50- I didn't bother enquiring about anything. Yeah so the lovely woman from the vintage shop also sells on the Vintage Flea at the Custard factory on a Saturday. She said that last Saturday, she was chatting with someone from the X Factor who spent over £100 there on outfits to wear on the show (she'd just completed Boot Camp). Now, from what she told me: 'a black girl who sang soul stuff, I thought she was really good but Simon gave her a tough time', my best guess is that she meant Birmingham's Kirsty Reeve who ended up singing Valerie by the Zutons (or Amy Winehouse, take your pick). So look out for this girl wearing some Birmingham-sourced vintage gear! Oh and go and support the lady I mentioned's new shop, she's great! Sorry for such a long-winded post too, it's been awhile! The General Stores unit was ran by Urban Village so when another UV outlet was opened at the Oasis i think he decided he didn't wanna spread himself too thin so wound it down. I heard it was Urban Village but I wasn't sure! I like it in there, has a different vibe to the Custard Factory shop. I'm envious of the great cardi jumper. I found one but it's too thick, boxy and huge. I'm like the Goldilocks of Aran knits! I loveee all your vintage finds! You are going straight into my bloglovin' miss!